While there are numerous varieties of Cool Whip Whipped Topping (including sugar-free), the nearly 50-year-old brand -- launched in 1966 -- is just introducing its first non-topping extension: Cool Whip Frosting. Three flavors of the new frosting (chocolate, vanilla and cream cheese) began hitting store shelves in September, and the launch’s marketing campaign kicked into full gear this month. Cool Whip Frosting is among the latest in a string of new-category extensions from venerable brands at Kraft Foods (Velveeta Cheesy Skillets and Planters Peanut Butter, to name two). In this case, product development research revealed that consumers were dissatisfied with shelf-stable frosting products, Cool Whip Brand Manager Marjani Coffey tells Marketing Daily. “Consumers said that shelf-stable frostings were too sweet, too thick and too hard to apply without damaging the cakes or other baked goods in the process,” says Coffey. The new products are located in the frozen foods aisle, next to the brand’s whipped toppings, so part of the marketing mission is alerting consumers used to finding frosting in the baking aisle that a new option can be found in the frozen aisle. Hence, in-store promotions include shelf-talkers in both the baking and frozen aisles, reports Coffey. Digital ads are being run on KraftRecipes.com, and may be expanded to third-party sites, according to Coffey. A digital coupon, and FSIs in early November and early December, are also in the mix. 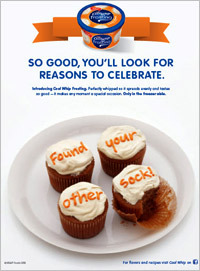 In the social arena, the emphasis is on Cool Whip’s active Facebook page. The page currently has some 334,000 “likes” -- up 11% since the brand starting promoting the new frostings there, Coffey reports. As with other brand extension campaigns, this one is expected to have some halo benefits for the brand’s existing, familiar products.